The headline news from paidContent is that cheap Android Devices will ensure Google dominates the mobile OS market well into 2015. 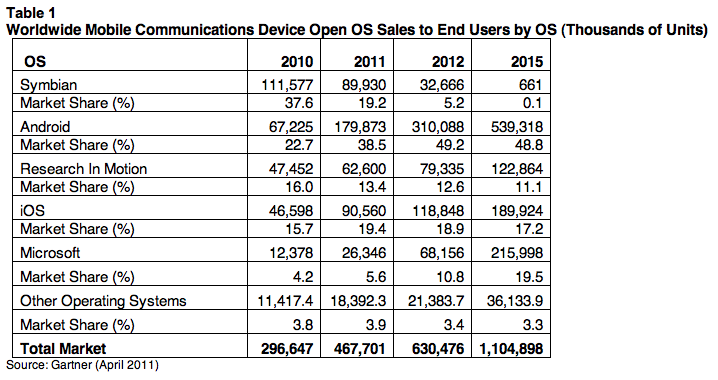 The Gartner report has Symbian shrink to a mere 0.1% marketshare, RIM reduce to 11.1% but Android surge from it's 2010 base of 22.7% to 48.8%. That's the headlines. What caught my attention was the contrast between iOS and Microsoft. 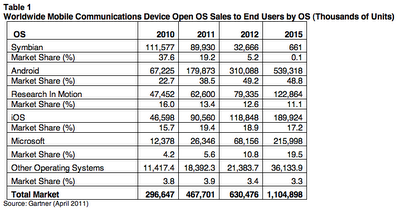 iOS grows, but only just, edging up from 15.7% marketshare this year to 17.2% by 2015. Compare that to Microsoft, currently with Windows Phone 7, who move more impressively from 4.2% marketshare to 19.5% by 2015. Before we think whether or not Windows Phone 7 can do that I think we need to mull over when the next mobile OS from Microsoft will be out. When will we see Windows Phone 8? I suspect, in order to be successful, we'll be up to Windows Phone 9 by 2015. Will we have Windows 9 by 2015? You know; the OS for the PC in the post PC area. I'm not sure. Despite what happens with the evolution of OS I'm sure that Microsoft and shareholders will be extremely pleased to see Gartner project a 500% increase in marketshare and a move into second position ahead of Apple. Do you agree with Gartner's highly paid research brains?